Spoiler alert: The Type R doesn’t like making power. Due to a stubborn ECU, this system has set torque tables in place that make it extremely challenging to increase power using popular bolt-ons that have proven to realize gains before. 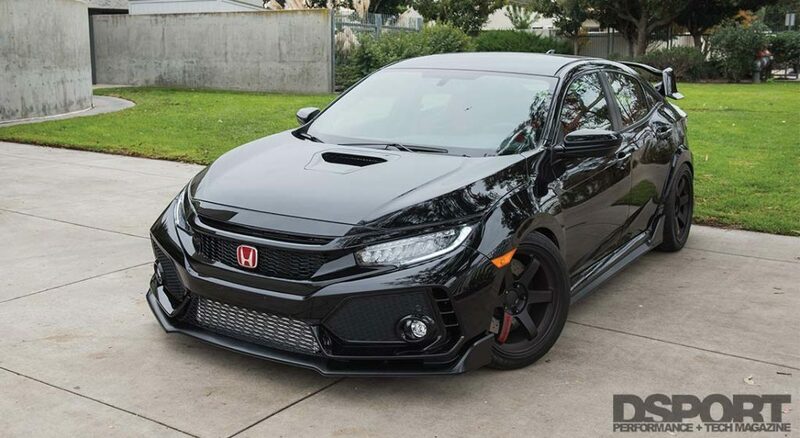 Powered by a 2.0-liter inline-four engine, the Type R delivers 306 horsepower and 295 lb-ft of torque. To cement the newly-introduced R badge in the United States, the Civic Type R set the Nürburgring lap record for front-wheel drive vehicles with a 7:43.8 lap time. Our curiosity pushed us to explore the aftermarket potential of the Civic Type R, so we tested what the average owner would be looking to upgrade on their 2018 Honda Civic Type R. The results were – different. As per all our testing, we start by strapping the bone-stock vehicle to the dyno to get a baseline. 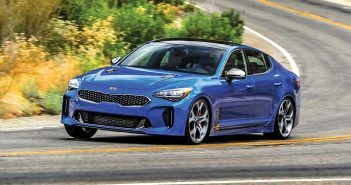 Advertised with a stock power of 306 engine horsepower and 295 lb-ft of torque, we wanted to see how much of this power makes its way to the wheels. 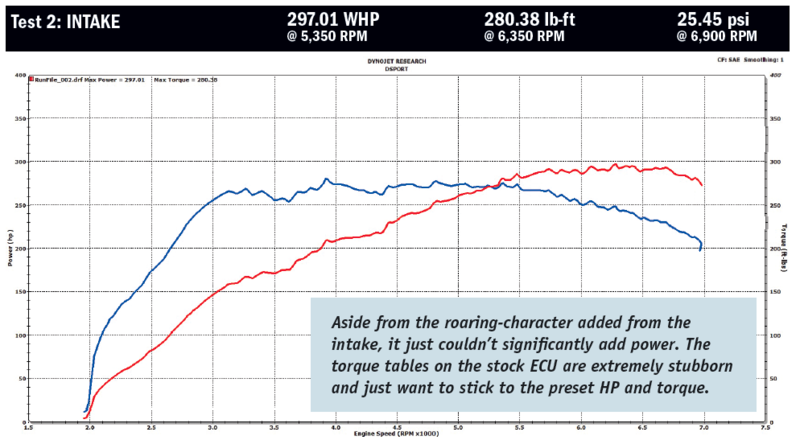 On our Dyno, the Type R showed an impressive 293.25 peak whp, and a peak of 282.84 lb-ft of torque. On average, the drivetrain loss is between 10-15% on front-wheel drive applications. However, the Civic Type R only showed around four-percent loss in both horsepower and torque. The boost comes on a little after 2,000 RPM and peaks at 4,000 RPM, delivering a smooth and consistent power curve. With the baseline done, it was time we start dropping in the bolt-on parts to see what kind of additional power and torque they offer. For this Test and Tune, we will start by replacing the stock airbox with an aftermarket intake system. This will be followed by an exhaust system, which is not only beneficial for power delivery, but it also adds a much-needed tone to a very quiet factory exhaust. After the exhaust, we will reflash the factory ECU, and finalize our testing with an aftermarket intercooler. With the Type R claimed to be one of the best cars in its category, it will be interesting to see how good the factory parts are and if aftermarket solutions can add significant value. We removed the factory airbox and installed the AEM Cold Air Intake in its place. 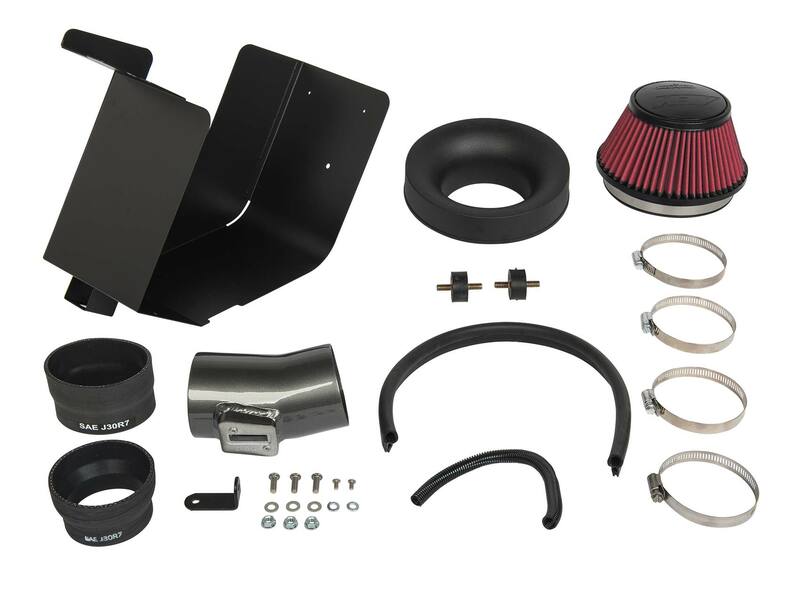 It is designed to allow your engine to breathe more air when compared to the factory airbox. 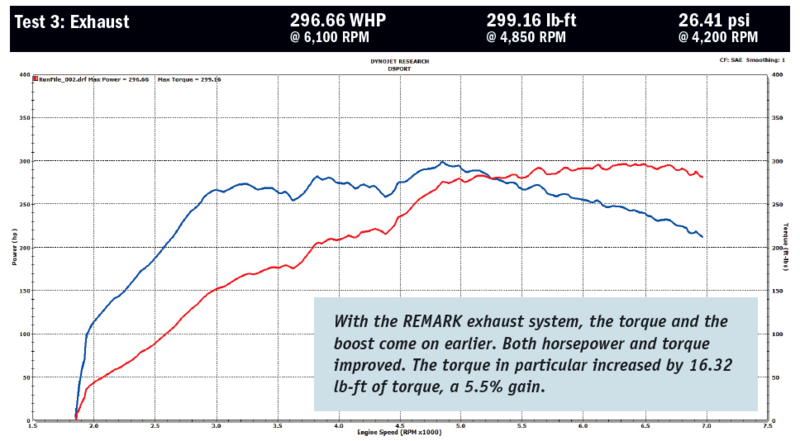 The AEM Intake showed 297.01 peak whp and a peak 280.38 lb-ft of torque. 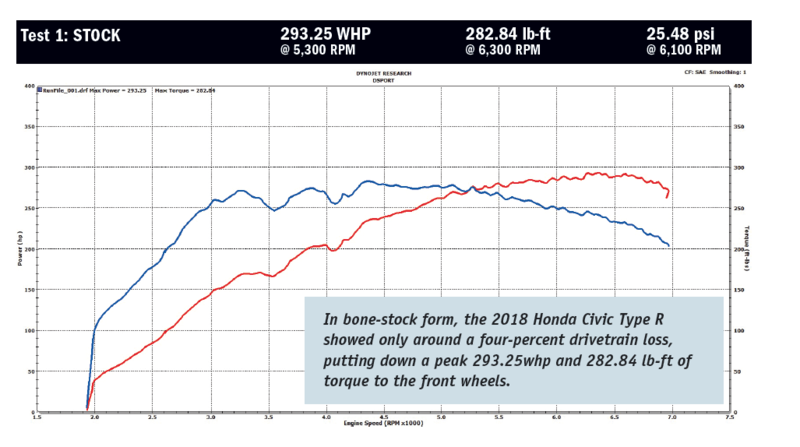 The intake increased the horsepower by 3.76 whp; however, a drop in boost at 5,500 RPM and again at 6,400 RPM decreased the torque by 2.46 lb-ft of torque. With the factory ECU, the torque tables in place restrict additional horsepower and torque to be made with usual bolt-ons. We decided to revisit the intake again after the ECU reflash to see if it can make a difference. 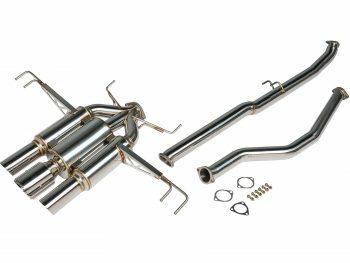 Although the real bottleneck comes from the turbocharger, the cats, and the downpipe, sometimes the factory exhaust can be holding back some power. In addition to that, one of the biggest complaints of the Civic Type R is how quiet its factory exhaust system is, so an aftermarket exhaust is usually a must for new owners. We used the REMARK FK8 Spec-III exhaust. With the stock airbox on, the REMARK exhaust pushed the power from the factory 293.25 peak whp to 296.66 peak whp. 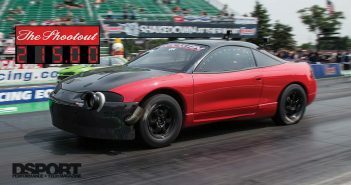 The big difference, however, was in the torque, pushing the stock peak 282.84 lb-ft of torque to 299.16 lb-ft of torque. This is a 5.5% increase in peak torque (16.32 lb-ft of torque). Although the power and torque curves increased, they remained virtually identical. 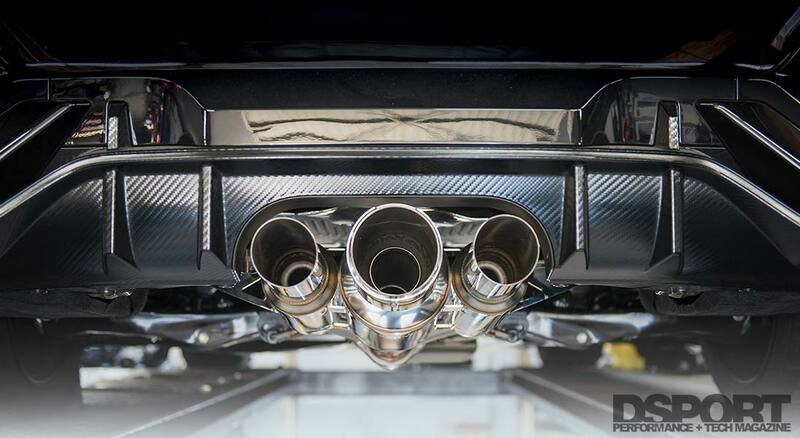 The REMARK exhaust also added a far better note when compared to the factory system, with just a slight drone at specific RPMs only heard from the backseat. With both the intake and exhaust on the car, the Type R put down 295.80 of peak wheel-horsepower, and 293.34 lb-ft of peak torque. 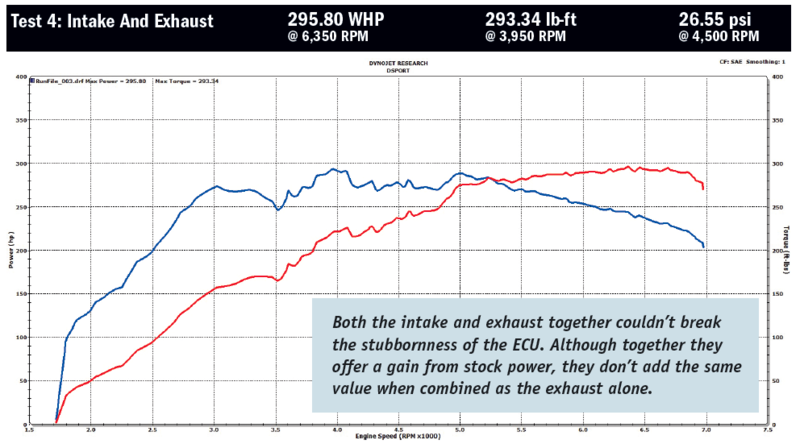 Together, they increased the intake’s torque by 12.96 lb-ft of torque, a 4.4% increase. However, both intake and exhaust horsepower decreased when compared to testing them individually (still power gain from stock). There may be performance merits for these systems if they’re able to consistently deliver cooler air with the least airflow restriction to the engine in real street driving. Our Dynojet has a rather efficient fan system, which could sometimes mask the efficiency of other parts. Next, we test the Hondata FlashPro reflash with the intake and exhaust system. Thanks to Doug Macmillan of Hondata, a Hondata FlashPro reflashed the Type R’s ECU and it went back to the dyno with the AEM intake and the REMARK exhaust. 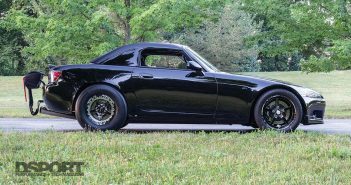 The combination increased the horsepower from 295.80 peak whp to 319.78, and 293.34 peak lb-ft of torque to 338.79 lb-ft of torque on 91 octane. This yielded a 7.5% increase in peak horsepower (+23.98whp) and a 13.4% increase in peak torque (+45.45 lb-ft of torque). The ECU tune significantly improved the dip at the 3,500 RPM mark and delivered the power and torque much sooner than with the factory ECU settings. 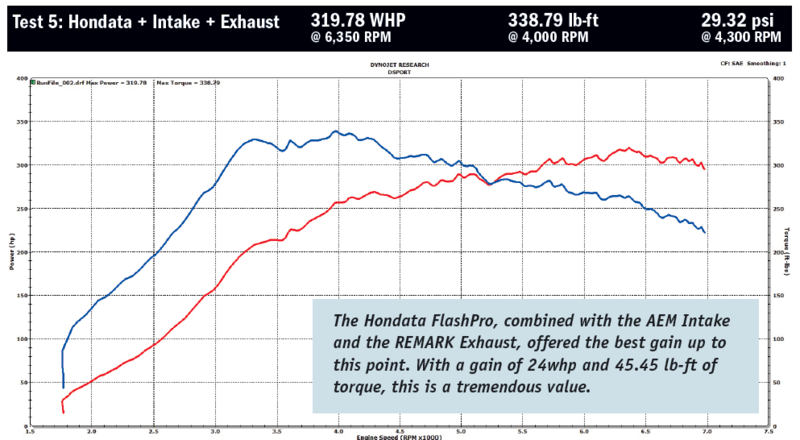 With this significant power increase, we decided to explore what the Hondata FlashPro can deliver with the factory intake and exhaust. We swapped the AEM Intake and the REMARK exhaust with the factory parts, then strapped the Type R back on the dyno. With everything stock and just the reflash, the car delivered 314.15 peak whp and 332.27 lb-ft of peak torque. This is a 20.9whp (+6.7%) and 49.43 lb-ft of torque gain (+15%). The biggest torque increases occur at 3,200 RPM and 4,400 RPM, which is right in the middle of the driving range. After using Hondata’s base map, we continued exploring the limits of the FlashPro system. We took the air charge, which determines the amount of boost we’re taking on, and we increased it five-percent. This didn’t give us more horsepower. We then reduced the boost, and the result was less horsepower. This showed us that the preset boost for the Hondata base calibration is optimum. Next, we added two degrees of ignition timing, this increased horsepower by 5-10whp from 4,500 RPM to redline. This showed that the FlashPro didn’t hit its limit, instead, Hondata built a safety margin within its stock calibration. So, regardless of the quality of fuel you use, the stock calibration of the FlashPro is the perfect combination of reliability and performance. With the AEM Intake, REMARK Exhaust, and the FlashPro ECU Reflash, we installed the Full-Race intercooler. 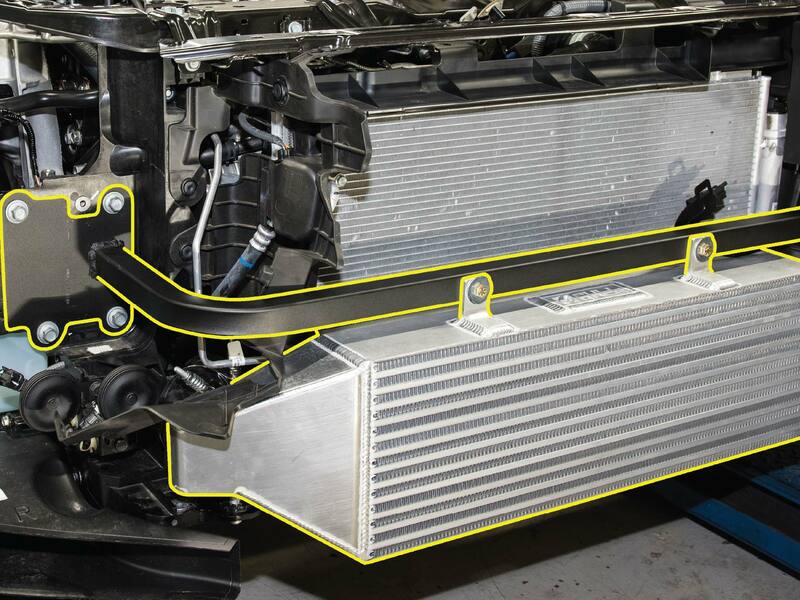 The intercooler kept the intake air temperature lower than the factory intercooler, and it kept it lower longer. With the stock intercooler, the air intake temp went from 77°F to 117°F as it heat soaked, while the Full-Race intercooler stayed consistent around 72°F. This translates into more laps on the track with the car staying at consistent horsepower and torque levels. 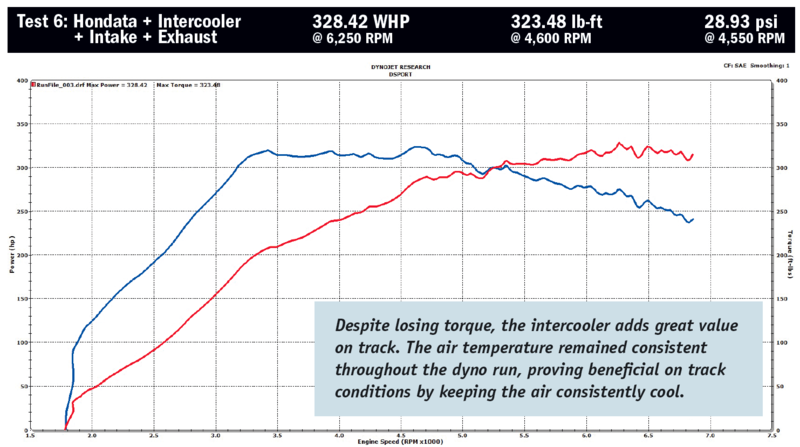 On the dyno, the intercooler showed a gain of 8.64 in the peak whp, and a loss of 15.31 lb-ft of torque. Both power and torque curves got smoother between 3,500 and 5,000 RPM. Sometimes, however, not losing power is a gain in itself, so by maintaining cooler intake air charge, this Type R will consistently deliver the same power and torque, while the factory intercooler will heat soak and start losing power after a few laps on the track. If we’ve learned anything from this test, it’s that the Type R’s ECU is a stubborn system. Without a reflash, it simply doesn’t want to change the power. Perhaps the factory engine with the stock turbocharger just doesn’t have enough airflow potential to need more than the factory intake. The torque tables on the factory ECU don’t allow power to be changed. The AEM Intake didn’t increase the sound too much; however, it gave the engine some character. Hondata will be doing an airflow test for some of the most popular intake systems available. We will be helping them gather some of the data to see the results and how they compare to modern factory airboxes. 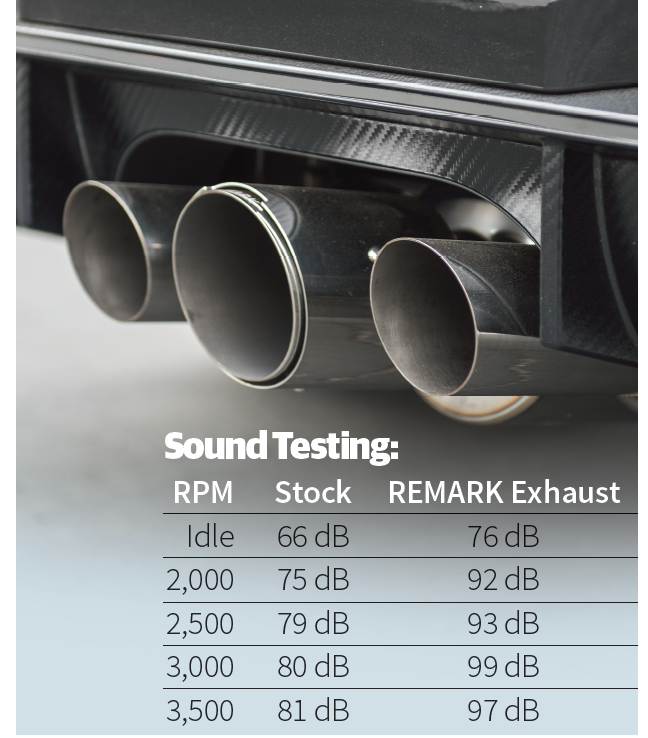 The exhaust is critical in terms of sound, as the factory exhaust is simply too quiet. The airflow’s bottleneck most likely comes from the turbocharger, downpipe, and cats, so it’s possible with a downpipe and a bigger turbo that we see this exhaust add even more value. The Hondata FlashPro reflash seems like a no-brainer. It unlocks significant power and torque gains, while operating reliably. If more power is needed, the FlashPro has the potential of going even further with a custom tune. Although the intercooler lost torque, it makes it up in horsepower and consistently-cool air intake temperature. 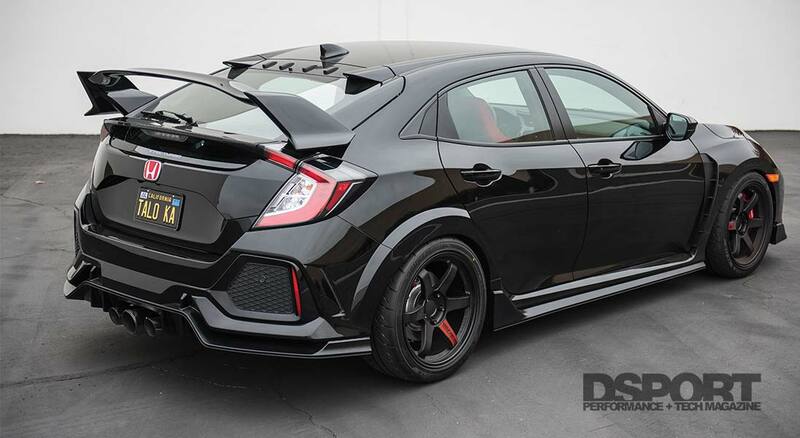 Next step will be to take a 2.0-liter Type R engine apart to see what we can do to make it deliver the type of power we like to see at DSPORT.